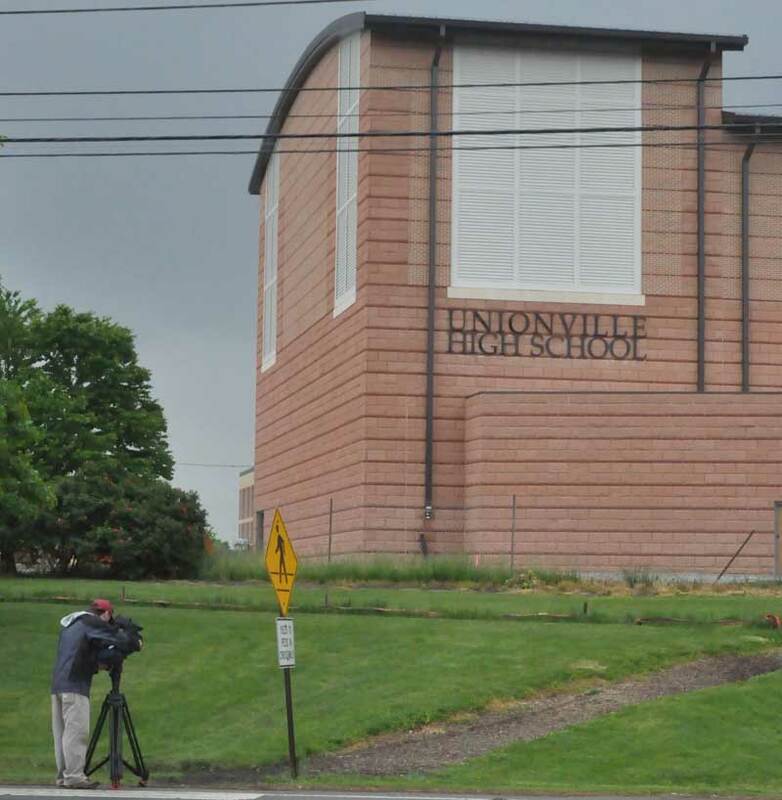 An NBC-10 video journalist shoots images, Friday, of the Unionville High School auditorium — the focus of a dispute between East Marlborough Township and the Unionville-Chadds Ford School District. EAST MARLBOROUGH — When I saw the videojournalist from NBC10, I knew, officially, that things had gone off the rails into stupidville. The videojournalist (I’m old enough to have been called a camera man when I hauled a Hitachi FP-10 and tape deck for Westinghouse, back when I produced a daily local news show a gazillion years ago) was there to shoot video of the new auditorium for Unionville High School. I don’t want to alarm you, but if you read the press reports, watch TV, or listen to some local officials, it popped up suddenly, looming over the township, blotting out the sun and placing democracy itself under attack. The building is 60 feet high — 60 feet! — and above the township’s height limit (or it’s not, if you ask the school district, which has some new math take on it, which I’ll get to in a minute). And resolution of this horrific dispute is virtually impossible, according to today’s issue of The Daily Tyrannosaurus Rex (who knew you could buy four-inch wide newsprint, suitable for taping to the front of your iPad? ), getting a zoning variance is rare and would set an ugly precedent, leading to, I dunno, skyscrapers dominating the skies of Willowdale. And some, gasp, say the building may have to be torn down. All of that is such a high-quality pile of manure, a mushroom farmer would sell his soul for it. On the record, both sides — the Unionville-Chadds Ford School District and East Marlborough — aren’t saying much, noting that this little tiff is a matter of litigation. But…being the pest that I am, I managed to dig out the issues in this special little exercise in miscommunication, confusion, politics and mind-numbing stupidity, figuring somebody needed to explain this mess. Like every building project, the entire site plan for the renovations went before the township, including site elevation plans. They were approved — but, and here’s the confusion: how high is 39 feet? That’s the height limit for building in the township under the zoning ordinance. Well, much like President Bill Clinton’s definition of “is,” it kind of depends. Measured from the east side of the building, at the highest elevation of the property, the auditorium is 35 feet tall. Measured from the ground by the auditorium, it’s more like 60. Oops. So here’s the crux of the dispute: the township says the building violates the township’s zoning ordinance and the school district says the building exactly matches the plan presented and approved. And it appears from here both sides are right. Of course, the metal framework for the building went up last August, and yet, it took until a few weeks back for someone to notice — understandable, as the building is hidden away there where no one could possibly see it — a couple dozen yards from Route 82, a couple of hundred yards from the township building. So, let’s see. The township missed this detail and the school district was probably just a little too cute by half and tried to sneak something through that was iffy at best. Obviously, the sane solution is this: ask for a zoning variance. And the township should grant it, allowing both public entities to return to coping with slightly more important things. Yeah, I know. The school district doesn’t want to admit there was anything wrong with the original design, but, to be honest, common sense tells you the auditorium is 60 feet higher than the ground it sits on, so at minimum, the design violates the spirit of the ordinance if not the law. A good neighbor would file for the variance and move on. And township should, without a whole lot of bluster, grant said variance. Can the district prove hardship? Yup. The township approved the original plan and allowed the district to spend many, many millions of dollars (our tax money, by the way) before raising a stink about it. Voila! Grounds for a variance and to make the whole thing go away. Sure, you can’t give out variances like candy on Halloween — but they’re pretty common and are reasonably typical when it comes to site development. Ironically, had the township caught the issue in the first place — and so many eyes, both those of township employees and elected officials, saw these plans long before the first shovel hit the ground, that no one is really in a position to point fingers — the variance would have been a tougher argument. Will it set a scary precedent? Only if other property owners sneak, uh, creative design elements into their plans and the township whiffs on noticing them. It’s safe to say that future plans will get pretty vigorous vetting from here out. That’s how it should happen, if common sense trumped politics. But, nope. Instead we have a hearing Tuesday night — more than likely one where not much is going to happen, the issue will drag out and attorney bills will continue to mount — with the same outcome: the auditorium isn’t going anywhere, fingers will be pointed and much will be made of next to nothing. @ Vickie- I applaud your willingness to step up and call it “like it is”. UCFSD is exactly that (in their mind) above it all, and it really should stop. Clearly the vote was a “NO” on this project, at this cost, twice. Didn’t matter – the continued suburbanization is what this is all about. And, in my opinion, if that’s what you want, I’m perfectly fine with that – go back to Springfield, or wherever else in DELCO you’ve come from. As for the “stupidity” – I find it most interesting that the editor can use inflammatory comments directed at individuals within the local government and / or school board but will censor the comments of those inflamed by his biased opinions. I banned one poster who violated our terms of service. Twice. After a warning. Everyone else has gotten their say. If you prefer less moderated, more hit and run comments, there are other publications out there willing to cater to your desires. I’d like to make sure I understand whether this is appropriate, as posted, to have respectful discourse – or in fact you simply want your readers to agree with your opinions. Kindly advise if a differing point of view falls under your “Terms – “Objectionable Material”. I will add if a difference of opinion is objectionable, well… I guess I need not be objectionable. And to be clear, you make some rather violently incorrect assumptions about where my personal opinions lie — and yet, here I am allowing it to be posted. And, might I add, you rather ironically engage in very much the same sort of parsing to justify your behavior that you decry coming from the school district. And while I wouldn’t feel the need to ban you for that, one must wonder how you deal with such a personal inconsistency. Let’s start with the fake URL. I haven’t posted any URL. Please explain what you are referring to. As one — and only one poster has been “censored” here, the individual posting as “DaFacts” and “DaTruth” — I’m assuming that’s you. The use of the http://www.fireparker dot com url led to no Web site. I warned the poster about it, and the poster did it again. That’s the extent of my censorship. So, as you were complaining about having been censored, it seemed logical that you were the poster involved. Again, nothing compels you to post here. But if you do so, you do it under the rules that have been made abundantly clear here. The following is a post from DaFacts, who violated our terms of service and also posted a bogus URL after specifically being warned not to by me, and has been banned. Nope. I post this to make sure people understand we have a few rules and that this will not be run like the Wild West of some newspapers’ comments areas. No fake URLs. No relentless personal attacks — attack the idea, not the person — will be permitted. Every comment should be one your (or my) 10-year-old kid should be able to read without embarrassment. I think robust, even intense opinion is good for a community discussion and I won’t get in the way of that. But I ask you to observe a few basic rules. Once again this arrogant school district, ( who else would spend our tax dollars to sue Longwood Gardens for real estate tax and lose, thus trying to break a national code on non profits), ignorantly denies local code. Isn’t this expansion extravaganza the one voted down twice by the local community. Why does this arrogant school board consistently think they are outside the will of the community? It’s ridiclous that the East Marlborough Township only allows buildings to be 35 feet high. It’s a terrible use of land resources. Such a height limit encourages sprawl because developers have to create space primarily in a horizontal fashion instead of a vertical fashion. Growth that expands out instead of up makes land prices higher, putting pressure on precious farmland and destroying rural areas. Sprawl is also costly. It costs money to maintain roads. It is costlier to provide school bus service, public transportation, police service, fire department and paramedic services, and garbage and recycling pick-up. With gas prices being what they are, local governments should be encouraging higher buildings and higher density in order to make localities more walkable and more transit-friendly. Higher density and grided street networks give people MORE choices. People do not have to rely completely on automobiles. Rather, they can use cars, walk, or public transportation. A reminder: no fake domains.